One may say that loyalty has become a rare virtue in today’s modern times. With too many options to choose from, it is easier than ever to get confused and keep hopping from one to the other. But deep down inside, everybody prefers to settle and be stable. Loyalty is actually comfortable because it saves us from dilemmas of decision making each time. 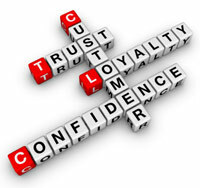 We are all looking for somebody dependable and trustworthy, not just in relationships but also in business! We all want to find reliable products, which we can buy without a second thought. Products that promise us quality!